Everyone wants to decorate their kitchen in a unique style. If you have a kitchen that is just connected to your lounge then it should look equally decorated as your lounge does. So today I will be giving you a few ideas that help you make your kitchen unique, clean and beautiful and eye catching! A small sized kitchen looks really cute if well managed. But did you know that you can make it look big? Yes you can! Light colors make things look bigger. Paint your kitchen walls with light colored paints. This will help your kitchen look bigger. It is also very trendy to paint the two opposite walls in one color and the other two in some other. This gives a good contrast to the walls and also looks elegant. We always look for stylish wall hangings for the walls of our bedrooms and sitting rooms. One or two little wall hangings will look very well in your kitchen. If you do not want to make it look too congested, you can hang a key holder or a cutlery stand with the wall. This helps empty some shelf space as well. A small kitchen may not be able to hold a large table but a small kitchen table or a couple of chairs would do well. Kitchen table can be decorated with table mats. These mats look really good if they match the wall paint color. A small vase in the middle with fresh flowers will give a refreshing feeling when you sit for a cup of coffee after a tiring day! Kitchen looks beautiful when it is bright. The lights in your kitchen can be white or can also be according to the theme of your kitchen if it is not a dark one. If you have a large sized kitchen then you are lucky in a way! You can use your favorite colors to paint the walls. Although dark colors make your kitchen look small but in a large kitchen you can even paint the walls with black paint. Black kitchen walls look really chic! 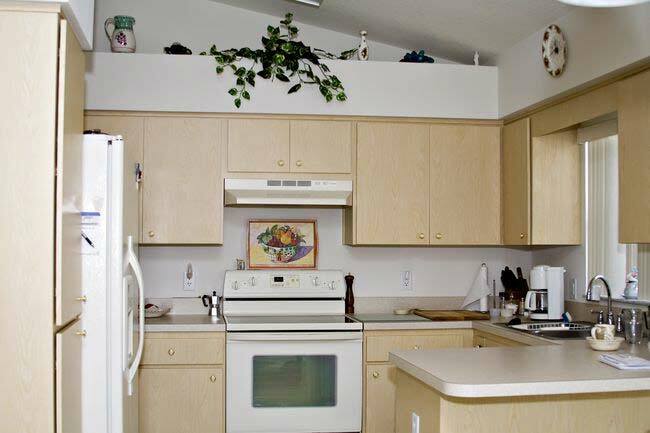 A large kitchen can be easily decorated with wall hangings of different sizes. If you want to hang fruit painting with one of the walls, it will look nice. A calendar with the wall to help you keep track of things and make notes on it will be helpful. It helps you to remember the important upcoming events. If you have a big family, your large kitchen will help you easily accommodate a large kitchen table. You can easily place a six or head chaired dining table at one side. Black and white colors make a good contrast in the kitchen. White painted walls with black furniture or the vice versa goes quite well. You can place knitted table mats, a flower vase and a cutlery set onto the table. A holder for different sauces also takes a small space so you can keep it on your kitchen table. If your kitchen has a window in it, use blinds. Curtains in kitchen do not look good in the kitchen. Orange and red color surroundings stimulate appetite! 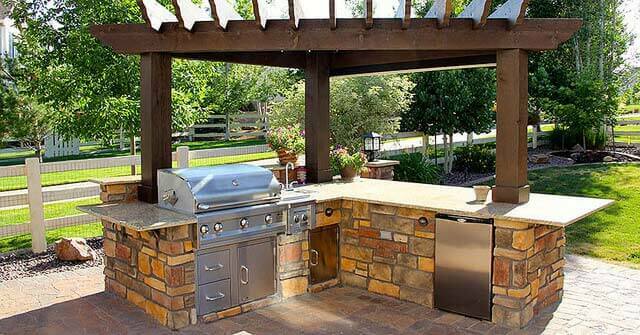 An outdoor kitchen will most probably be in your lawn. Make the grass of the lawn well trimmed and leveled. This gives a very nice impression to the guests. Living in an area with high rainfall rate? Keep a portion of your kitchen covered. Set your kitchen table and chairs under the shade. If rain falls, you can enjoy the view sitting there with a cup of tea or coffee. Keep the direction of wind in mind! In an outdoor kitchen, be very cautious while installing your stove if it is operated using gas. This helps you cook easily without the problem of getting fire extinguished due to wind every now and then. If you have a thermal cooking range then it is not a problem. Outdoor kitchens let you do barbeque whenever you like because all the mess gets cleaned easily leaving your kitchen tidy and beautiful. WHATEVER THE KITCHEN TYPE BE: STAY SAFE! All the above ideas and safety tips will make your kitchen look beautiful. Everyone will praise it especially if you use good color themes. Beautiful kitchen is of no use if you do not clean it in detail regularly. A simple kitchen also looks really good if it is kept neat and tidy. Therefore, keep your kitchen clean. Use mats on the floor too to avoid making mess with any liquid that may fall there. Keep your kitchen well organized. And what’s more? Your kitchen is all set to cook something really delicious and serve to your loved ones! 🙂 So grab a recipe, get your kitchen tools, and start cooking!